The Bankies dropped two vital promotion points at Holm Park to struggling Cumbernauld United as the sides fought out a two all draw. 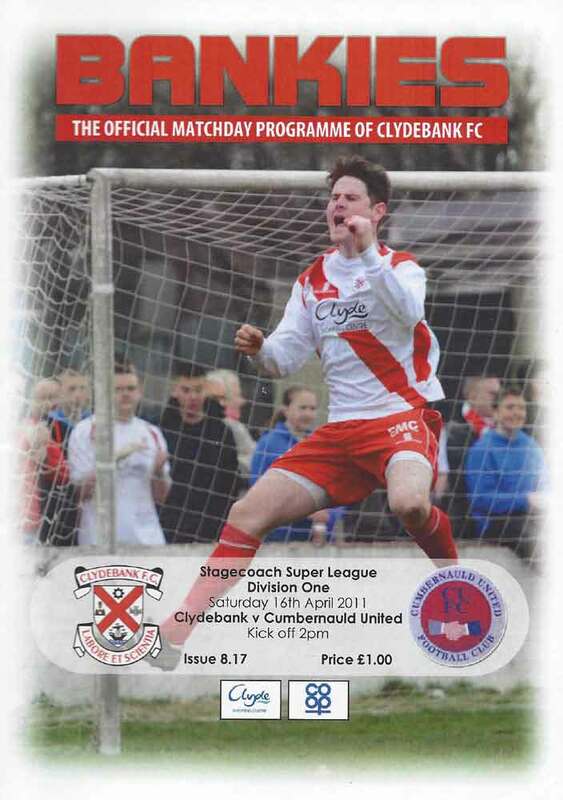 In truth, a draw was as much as Clydebank deserved as United fought and harried for every ball. The visitors deservedly went ahead through Gibson, but the Bankies turned the tie on its head through two superb finishes from Martin and MacKinnon. Thompson who gave the Bankies a restless afternoon throughout netted late on to give United a share of the spoils. Budgie McGhie named the same side who disposed of Kilwinning Rangers last week, with still no sign of the injured Murray and McMenamin. Davie Green who has also been missing was added to the bench. The Bankies almost got off to a fast start when Hobbs was caught offside from a superb through ball from Dallas. It was a touch and go decision as Hobbs raced in on goal. However, it was the visitors who signalled their intentions after nine minutes when Gibson overlapped in the inside of Mark Hailstones. He collected the ball on his way and rifled a shot just past Campbell’s right hand post. On the quarter hour mark, Cumbernauld were inches away from opening the scoring. When Thompson rattled a free kick off the cross bar, with Bankies keeper, Campbell well beaten. 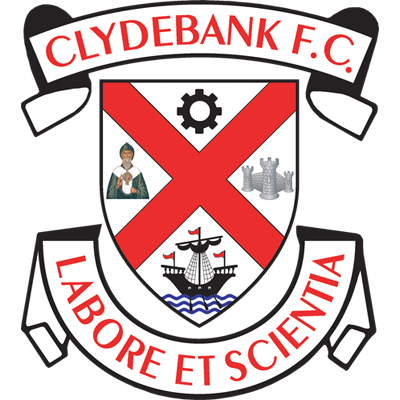 Two minutes later Clydebank registered their first shot on goal, but it was a wayward strike from Tommy Martin, which flew miles over the bar. The Bankies began to claw their way into the match and forced a series of corners, but it was the visitors who took the lead after this spell. It was Gibson who did the damage with a well struck dipping shot from 25 yards. Liam Campbell may be a little disappointed that he wasn’t able to keep it out, as the shot was quite central to his goal. United sat back a little bit after they scored, and the Bankies took full advantage by equalising eight minutes later. The ball was played down the left channel, and Stevie Dallas crossed from the bye-line. The ball took a nick off a defender on it’s way, and took the ball away from Tommy Martin who had his back to goal. But quick thinking saw Tommy hook an audacious overhead kick into the net with Buchanan rooted to the spot. Within two minutes, Cumbernauld were almost gifted the lead, as Campbell and Crawford got in each others way trying to get to a cross ball from the left. This led to the keeper fumbling the ball, and only quick reactions allowed the keeper to smother the ball at the feet of Ferns. Despite this mishap the Bankies were now playing their best football of the day. A free kick played deep to the back post was headed across the six-yard box by Dallas, and Hobbs was unlucky to see his attempt go just over the top. Four minutes from the break Clydebank did take the lead with another superb finish. Stevie Dallas sent Darian MacKinnon away down the right hand side. The ball sat up nicely for him as he closed in on goal and he fairly smashed it into the net from an angle leaving Buchanan with no chance. 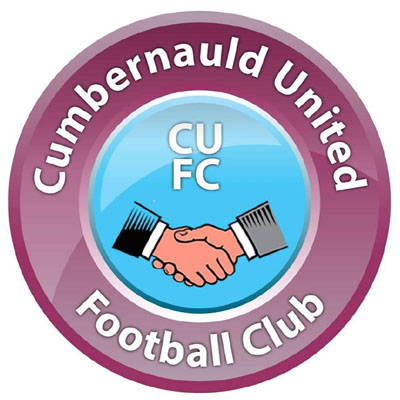 Cumbernauld had played with tremendous energy throughout the first half and were a little unfortunate to be behind, so it was vital that the Bankies matched this endeavour in order to hold on and even possibly increase their lead. And for the first fifteen minutes or so of the second half there was little to choose between the side with little or no goalmouth action. Possibly, the turning point of the match, was the injury that meant Stevie Dymock had to leave the field. The blonde haired striker was having a fine game playing in the hole behind the strikers. He was particularly effective at winning high balls and his link up play with the front two was excellent. Unfortunately, the Bankies didn’t even get a free kick for the bad foul that saw him limp off. Dallas dropped into Dymock’s position as McPherson took over the striker’s role. Green then replaced Hobbs who was having a quiet match. These changes seemed to knock the Bankies out of their rhythm, and the visitors really began to dominate the midfield. The pressure was beginning to tell as United forced a series of corner kicks, and it was from one of these that the equaliser came after 80 minutes. The ball was cleared to the edge of the box where Watts fires the ball through a ruck of players. Liam Campbell may have seen the ball late as he could only push the ball out in front of himself. Unfortunately, for the keeper, it was into the path of Thompson who bundle the ball into the net. With the match now in the balance the Bankies pushed forward and Hailstones, MacKinnon and Campbell all had shots on goal that did little to trouble Buchanan. Amazingly both sides could have won it in injury time. United, firstly sent in a free kick from the right which Thompson glanced across to the back post, but Ross Campbell came to the rescue by heading the ball off the line. Then, down the other end, Bissett was sent clear down the left wing. He ran towards goal at an acute angle, until he was literally only three or four feet away from goal. With injury time virtually complete, it was crying out for him to just hit it as the ball could have gone anywhere, but he tried to pass it, and the Cumbernauld defence managed to scramble the ball away. The Bankies home form has not been great all season long with more defeats coming at Holm Park than on our travels. This has been exemplified with the club only picking up four points in the last three league meetings. The over riding factor at this stage of the season is the ability to match the opposition – especially ones who are fighting for their lives – in energy and endeavour. After that, superior ability should take care of itself. Cumbernauld put absolutely everything into the match and fully deserved at least a point. Elsewhere Glenafton made it four wins on the trot, and they play their game in hand on Wednesday where they could cut the gap to three points. With the Bankies facing another struggler, Vale of Clyde, next weekend we have to make sure we collect the points to keep our noses in front.